Do you like romantic? And what you will say about the capability to win alluring prizes for that? Then you surely will like this amazing game, which awards you not only the light feelings, but also attractive benefits. You can say that love and money is not very good combination, but it’s definitely not about Rings and Roses Slot Machine. Don’t miss out your chance to win impressive jackpot of $30,000! You can get both gold and mind boggling emotions by playing this classic slot, which was developed by Microgaming group. It’s easy to play and also it’s easy to win. Here you won’t find difficult rules. Just take lucrative advantages by spinning 3 reels of this passionate game. And use all probable 5 paylines to fulfill your bright aim. Beyond you can get all of these benefits directly through your browser with this no download version of the slot machine. 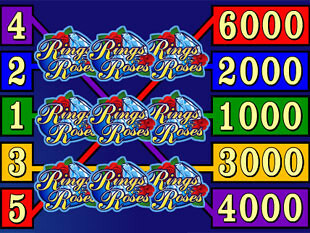 All lovers of classic slots can revel in world of engaging online gambling with exciting opportunities of Rings and Roses. You have limited number of the symbols, but at the same time illimitable capabilities. Beyond here you are awarded by one special symbol, which will help you to gain the largest money prizes of the game. This is a wild symbol, which can substitute any other icons to finish your winning combinations. And it’s represented by Rings and Roses Logo. Just collect three tender Logos on the line 5 to win the breathtaking jackpot of 6,000 coins, which can be also $30,000. Beyond you can get up to $20,000 and $15,000 for the same number of the symbol by catching them on the lines 4 and 3 accordingly. Read further to pick up how you can do that. Rings and Roses awards you tempting money prizes. But if you want to get the biggest and the most attractive of them, then you should pay attention that it’s possible only with Max Bet. Because the bigger your bet is, the more you can get. Here you will be able to set up to 5 coins per possible 5 paylines. Each of these coins can have different values, which vary between $0.25 and up to $5.00. So your highest stake can be $25 per one spin in the case you activate all lines and choose the maximum values per each coin. And the minimum bet can be only $0.25, it’s if you set 1 coin with value of $0.25 and activate only one line. It’s up to you to make a choice. But think about the opportunity to win $30,000 only for $25! Here you needn’t to make choice between the feelings and money. Just get a real treat by spending time here and also don’t lose such lucrative capabilities. 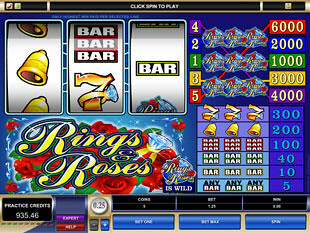 Rings and Roses classic slot gives you an alluring opportunity to combine love and gold. Your passion can bring you inimitable prizes. Relish your free time and at the same time try your luck. Just press “Spin” button to start your own romantic story in this game.